What is behind the resurgence of Muskegon? Look to its growing support for entrepreneurs. If you're looking to start a business, be sure to check out our compilation of resources in the right-hand sidebar (or, if you're on your phone, at the bottom of the article). Whether you're talking about a more equitable and inclusive downtown or the city's ever-growing number of shops and restaurants, entrepreneurs are the major players inspiring change in an evolving Muskegon. When Kevin Ricco, the director of Grand Valley State University’s Muskegon Innovation Hub, returned to his home city in 2000 after about a decade and a half of living elsewhere, this West Michigan metropolis was on the precipice of sweeping change. The industrial landscape that once dominated the city was shifting; the factory jobs people had relied upon for decades to feed their families were no longer a given. A year after Ricco returned, the Muskegon Mall shuttered for good, leaving in its wake a downtown almost entirely devoid of retail and a nonexistent street system in the 23 acres that, once upon a time, spelled economic revitalization for a struggling city. Not long after that, unemployment rates soared. But then? Jobs began to return to the city. Businesses started to open. Unemployment fell. The downtown became, well, a downtown. Streets were paved. Shops and restaurants lined the space that was once empty. People started moving downtown. For the first time in years, new construction, both commercial and residential, was (and is) happening. More than $200 million has been invested in the downtown over the past decade and a half. How did all of this happen? How does a city make the kind of turnaround that Muskegon is currently undergoing? It is, of course, a multi-layered story, filled with endlessly hard work from residents who refuse to give up on the city they love. And while the answer is a complex one, and one that’s being watched by post-industrial cities across the country, there is something that stands out as playing a starring role in the rebuilding of a city: entrepreneurship. “The resurgence in the city of Muskegon has been incredible,” Ricco says. “If you look at what’s happening, it’s really all about entrepreneurship. If you look at downtown proper and new ventures and the initiatives that have taken off in the last couple of years, and are about to take off, it’s all about those talented and hungry entrepreneurs who are willing to take that leap of faith. Those steps lead to bigger steps and bigger investment and bigger growth. 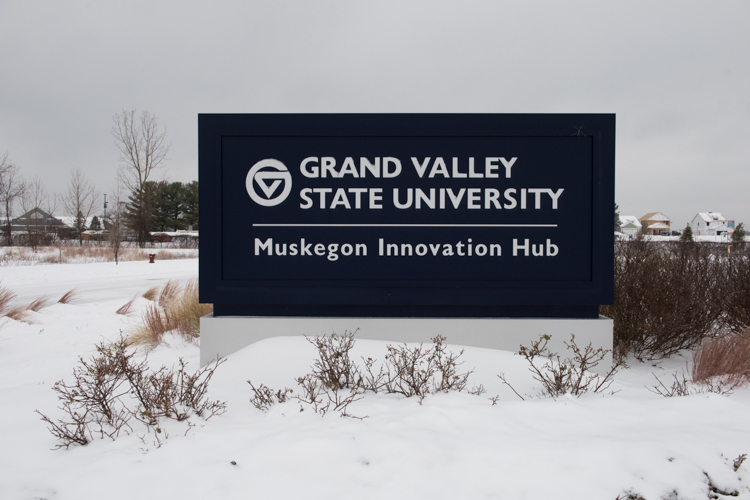 This world of startups, of big dreams and scary beginnings, is one that Ricco is intimately familiar with: the organization he helms, Grand Valley State University’s (GVSU) Muskegon Innovation Hub, works to support entrepreneurs and grow entrepreneurship throughout the city. 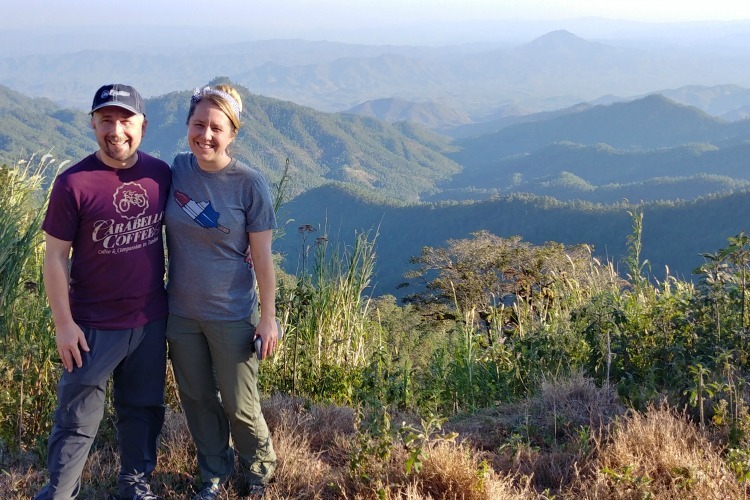 Through his work at the hub, he’s gotten to know the city’s growing economy well, and it’s a landscape that is flourishing with the support of the hub and other groups, both new and longstanding, throughout the area. “Muskegon has seen a lot of entrepreneurship for a long time now, with the economy having shifted out of manufacturing 20 years ago or so,” says Tom Hopper, the associate director for business development at the Muskegon Innovation Hub. “Muskegon is still trying to find its pace. They’re rebuilding economically and culturally, and entrepreneurship is a big part of that. Now, organizations throughout Muskegon are doing everything from offering mentoring and co-working space to providing funding for business owners who aren’t able to access traditional bank loans—and they’re busting that all too pervasive myth that great entrepreneurship exists mainly in Silicon Valley, that it’s the coasts that are the country’s drivers of innovation. And, sure, there’s plenty of impressive work happening in California and New York, but, increasingly, startups and entrepreneurs are looking to the middle of the country, including Muskegon, to launch or grow their businesses. After all, office space is affordable here; you’re surrounded by creativity that’s being born in places like Muskegon Community College and Baker College, both located in the city’s downtown; and, increasingly, there’s a very intentional focus on the part of many of these groups to support entrepreneurs, or would-be entrepreneurs, who have long been disenfranchised, including people of color and women. “I think people don’t always think of Muskegon as being an innovation center, but there are a lot of amazing entrepreneurs here. It’s inspiring,” says Julie Burrell, who worked with the Muskegon Innovation Hub to launch her startup, Pumpndo, a company that offers a clip-on that converts a bra into a hands-free pumping bra. Additionally, people of color face unemployment at rates significantly higher than their white counterparts. According to 2016 data from the U.S. Census Bureau, the unemployment rate in the city of Muskegon was 12.9 percent for white residents, 24.1 percent for black residents, 35.9 percent for American Indians, 20 percent for Asian Americans, and 12.7 percent for individuals who are Hispanic. People of color too face daunting barriers to starting businesses, including a lack of access to capital. 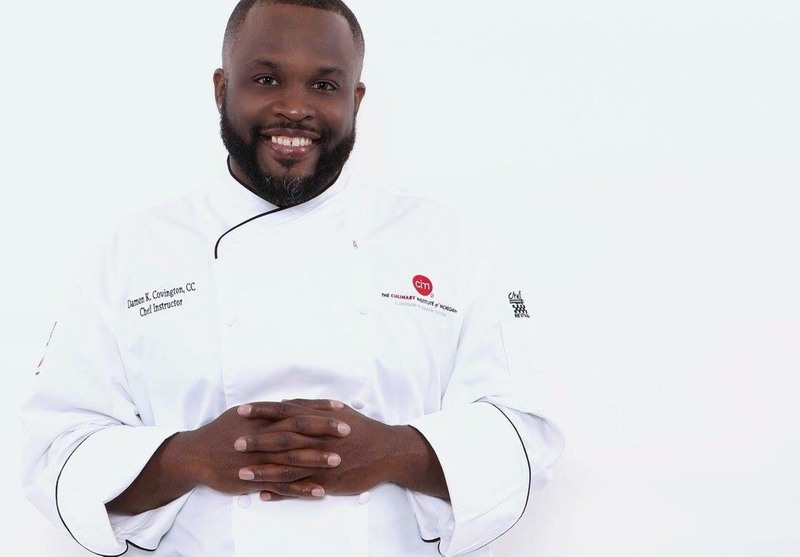 Chef Damon Covington, who grew up in Muskegon Heights and recently returned to Muskegon this year to teach at Baker College’s Culinary Institute of Michigan in downtown, says expanding support for business owners of color is crucial for the future of the region and will translate to a healthier, more equitable downtown, and city, in general. 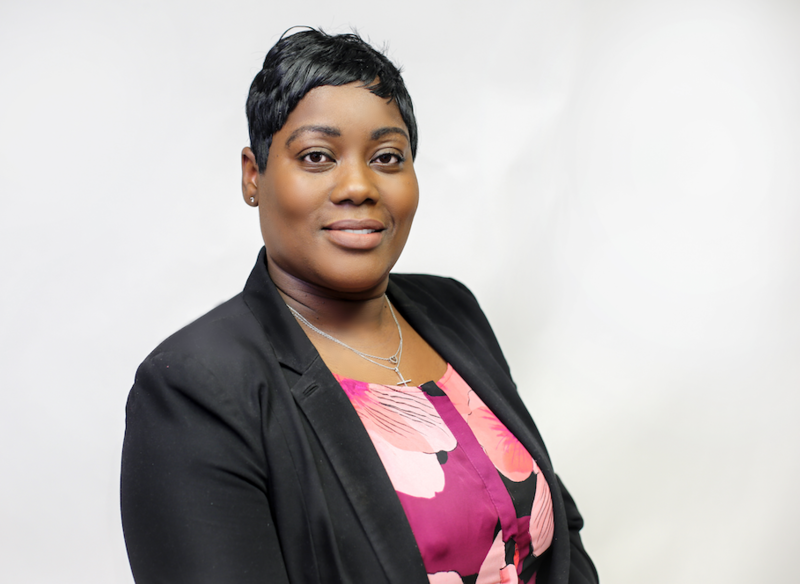 To address these disparities, the Community Foundation for Muskegon County is working to expand access to capital, business coaching, and mentoring for entrepreneurs throughout Muskegon, particularly among people of color and women. Additionally, the foundation provided a $30,000 grant to Grand Rapids Opportunities for Women (GROW), a nonprofit that works to support entrepreneurs who are women and people of color in West Michigan through micro-loans, mentoring, and more. GROW will use this money to hire a full-time business development specialist in the Muskegon area. 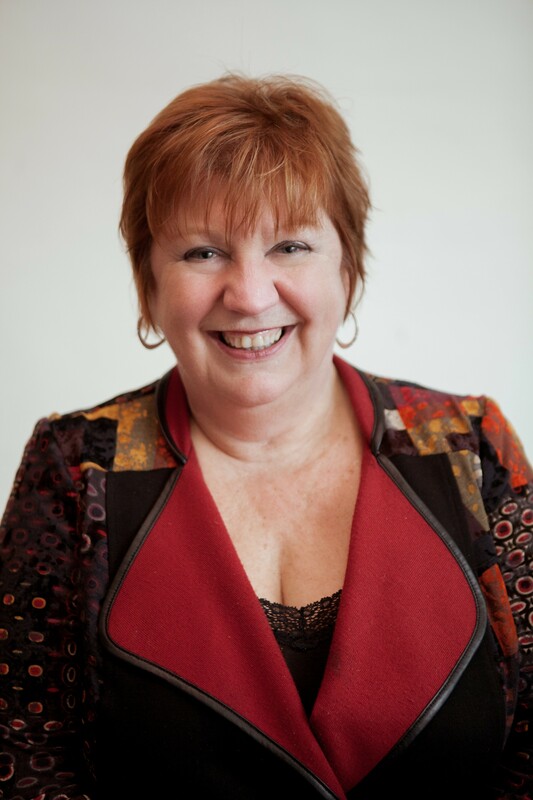 That individual will “be making connections with entrepreneurs, bringing entrepreneurial training, networking opportunities, one-on-one coaching and counseling, and access to capital” in Muskegon and the surrounding area, GROW CEO Bonnie Nawara says. All of this work, Community Foundation for Muskegon County President Chris McGuigan says, should translate to a stronger, more equitable city, including by building a more diverse downtown that is currently pretty homogeneous (individuals who are white make up much of the business ownership and the clientele for restaurants and shops). Northern Initiatives President Dennis West emphasizes the important role non-traditional loans can play in building an inclusive economy, noting that his nonprofit can focus more on an individual’s specific story, rather than, say, a credit score, as a bank typically does, when providing funding. “Muskegon I think is looking really exciting,” West says. “In the downtown, you’re seeing a lot more activity of small businesses and a real resurgence of a downtown and private investment. 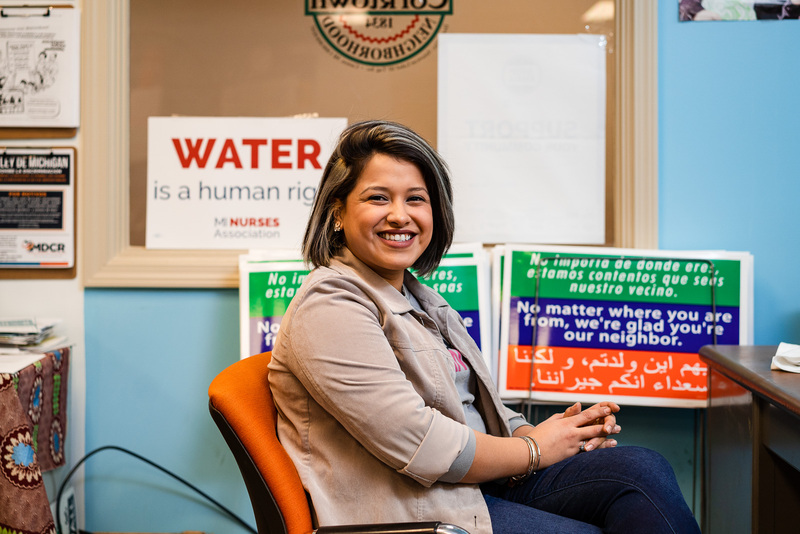 Similarly, GROW, which has operated in Muskegon for the past couple of years, began 29 years ago in order to serve “the economically disadvantaged community,” Nawara says, noting that 42 percent of the population served by the nonprofit is people of color. GROW’s average loan size is about $22,000, which businesses use for everything from purchasing equipment to operation expenses. In Muskegon, the nonprofit has given out 12 microloans totaling $374,000 to date. The organization has worked with 54 businesses in the city, a number that Nawara emphasizes is growing daily. 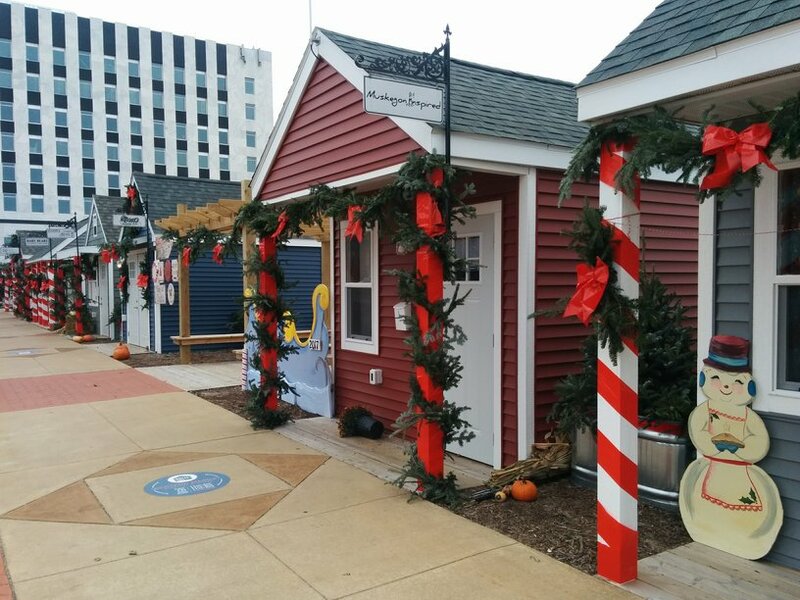 “We know Muskegon is exploding; we see great things happening on the lakeshore and we feel it’s really time to be out there and see if we can help with some of the growth,” says Nawara, whose organization worked with the city to set up the Western Market chalets and provided short-term loans to a couple of those businesses so the owners could pay rent or purchase inventory. One such business that GROW supported is Morat’s Bakery, which is opening a downtown brick-and-mortar store after a successful run at the Western Market. Like Northern Initiatives, GROW has a strong relationship with the Community Foundation for Muskegon County, as well as with GVSU’s Muskegon Innovation Hub. The hub has provided the nonprofit space to hold part-time office hours, and GROW’s business development specialist, for whom the group will begin its search in January, will likely be working at the Innovation Hub, Nawara says. “We were really excited to make these grants to Northern Initiatives and GROW in the same grant round because there’s no limit to the need, and we definitely want to encourage loans to people who are just starting their businesses,” McGuigan says. After all, McGuigan stresses, Muskegon will not thrive without an inclusive business landscape that supports those who have, for far too long, faced daunting barriers to launching their own companies. Area schools, including Muskegon Community College (MCC) and GVSU, too are stressing the need for greater racial equity and inclusion in the city’s commercial world, and both institutions are working to better connect and support entrepreneurs of color. Last year, MCC launched its “Community E” pilot program, an entrepreneurial training initiative for 40 disadvantaged high school students. Many of the students are members of Community enCompass’s Youth Empowerment Project, which promotes leadership development among high school students; Fresh Start, a group that works with teens who have been arrested; and My Brother’s Keeper, a collective of organizations dedicated to empowering boys and men of color. The 12-week program required participants to to start a business, and the project culminated in a mini trade show at which students sold their products and services to the community. 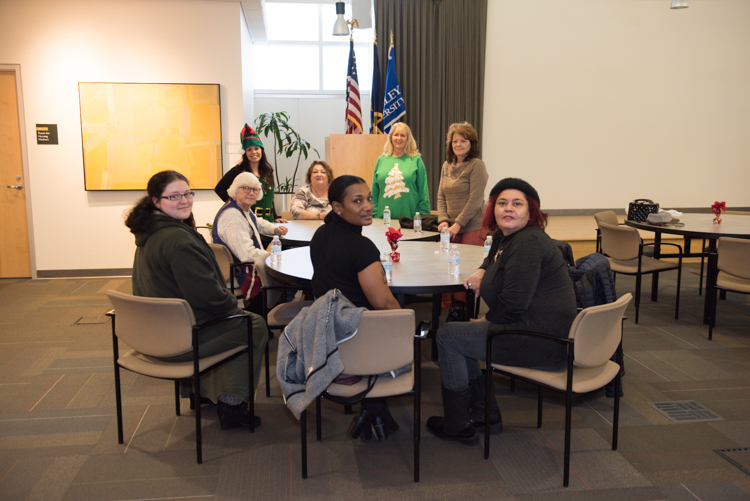 This winter, MCC is again offering the program, this time to a larger group of students. MCC also recently began to offer an entrepreneurial training program to elementary school students. 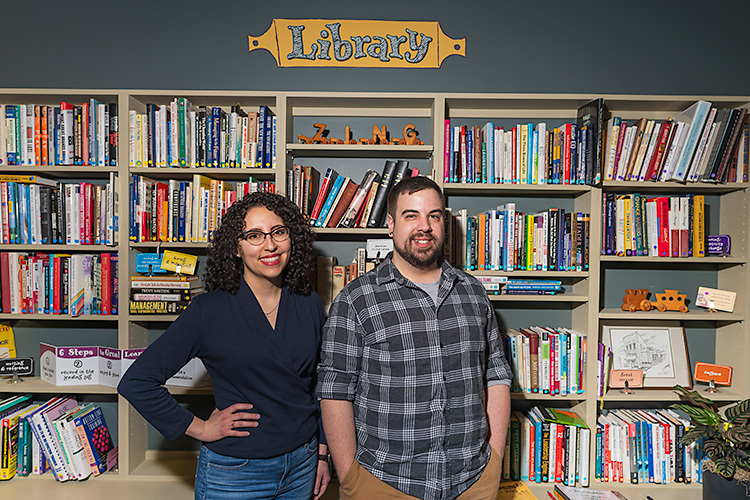 At GVSU’s Innovation Hub, Ricco, the director, says his organization is also working to better connect with, and support, entrepreneurs of color. To do so, the Innovation Hub is currently partnering with the city of Muskegon Heights to launch an entrepreneurship program in about a year. “We want to provide access to resources people have never heard of or considered,” Ricco says. 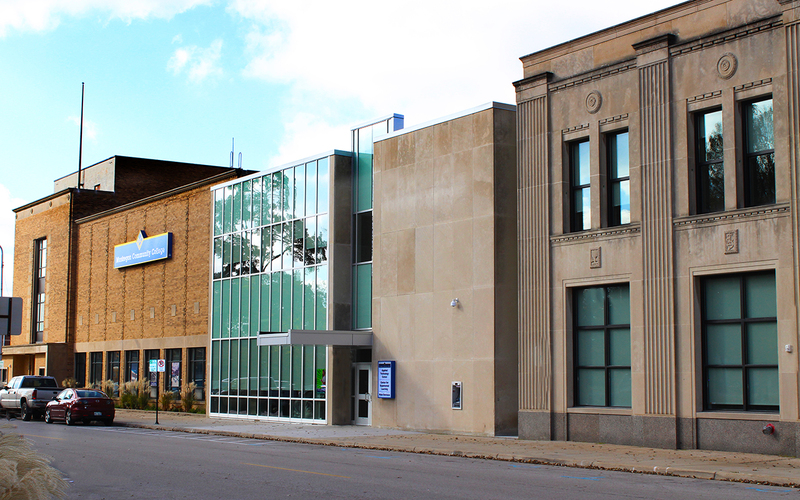 Muskegon Community College's new Sturrus Technology Center in downtown Muskegon. Photo courtesy of Muskegon Community College. A three-time entrepreneur himself, Stradal founded MCC’s entrepreneurship program five years ago in an effort to support students looking to find a place for themselves in a rapidly growing Muskegon. Now, after years of working with students and connecting them to the vast array of business resources in the community, from the Muskegon Lakeshore Chamber of Commerce to SCORE Muskegon, the entrepreneurial program and the college at large is setting the stage for major change. Come Jan. 11, MCC will officially celebrate the opening of its $14.81 million downtown center, which in September was named the Carolyn I. and Peter Sturrus Technology Center after the couple donated a record $1.5 million gift to the college. The new 85,000-square-foot center represents major opportunity for those studying business and entrepreneurship, with the space housing programs centered around electronics and automation, welding, machining, materials testing, foundry, engineering, and alternative energy. Additionally, it contains the Rooks | Sarnicola Entrepreneur Institute, which will feature the Lakeshore Fab Lab. Beginning in January 2018, the lab will offer entrepreneurs of all ages the chance to work with 3D printers, robotics, laser etching, production machining, and more. Targeting individuals from a wide range of ages, from Kindergarten through adulthood, the lab aims to support those looking to do everything from make prototypes (a first model of the product a business ultimately wants to market) to be of service to a growing medical community by providing machinery that can, for example, make prosthetics. 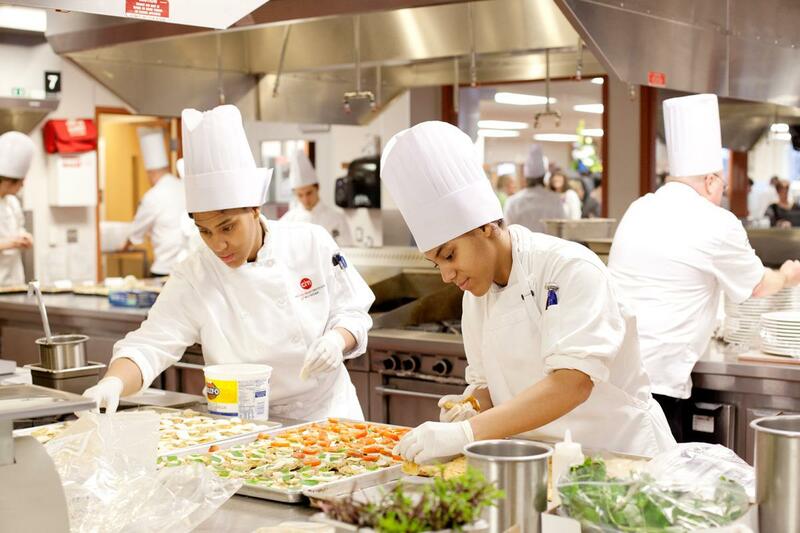 Culinary Institute of Michigan students. 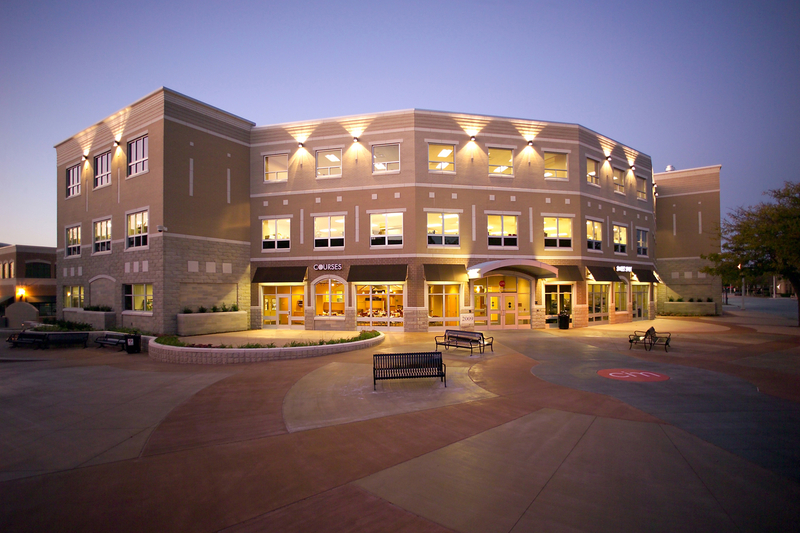 Photo courtesy of Baker College. Like many of those leading the entrepreneurial charge in the city, Jamie LeRoux, the program director and manager of Sweet Spot and COURSES Restaurant at Baker College’s Culinary Institute of Michigan (CIM) in downtown Muskegon, grew up here and has been thrilled to see the city’s growth—particularly when it comes to the food and nutrition landscape. “The downtown has gone through tremendous change. It used to be a ghost town, and when [the CIM] moved in, we saw so much growth happen around us,” LeRoux says of Baker College’s arrival in downtown Muskegon in 2009. The institute has been an instrumental player in growing the city’s economy, doing everything from preparing graduates for their coming culinary lives as stars in the region’s food world (such as Chef Char Morse and Chef Damon Covington, both of whom work and teach out of Kitchen 242, the culinary incubator downtown) to supporting the Muskegon Farmers Market and partnering with food- and nutrition-related groups across the city. To prepare students for running their own businesses, as well as to succeed in the food industry in general, the CIM has individuals work in COURSES, the student-run restaurant that’s open to the public, and the Sweet Spot, a student-run cafe. The Culinary Institute of Michigan in downtown Muskegon. Photo courtesy of Baker College. Perched on the edge of Muskegon Lake, about a third of a mile from the downtown Shoreline Inn, the Muskegon Innovation Hub supports the region’s entrepreneurs in three main ways: through business incubation (essentially working with owners to transform their business from the idea stage to a successful company), coworking space, and funding assistance. 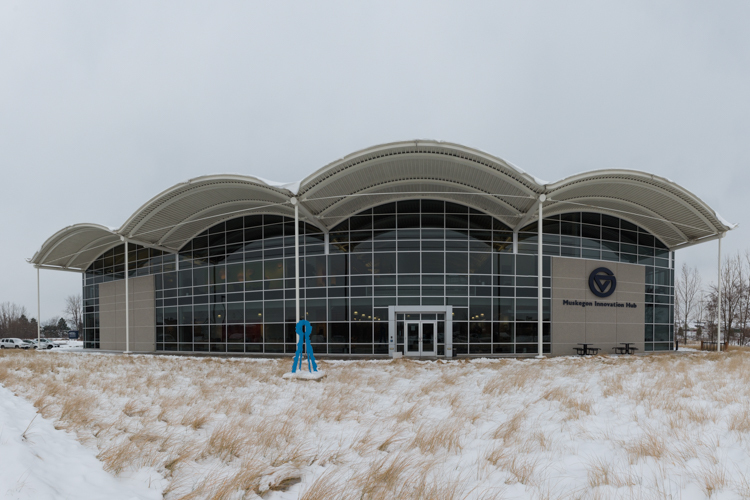 Formerly GVSU’s Michigan Alternative and Renewable Energy Center (MAREC), which too supported entrepreneurship in the area, the facility underwent a rebranding and became the Muskegon Innovation Hub last year. Almost immediately after the name change, the leaders at the hub began to see a change in the number of people turning to them for support, and the hub’s growth has also been boosted by close partnerships with a number of other organizations focused on growing entrepreneurship. Among the organizations the hub works with include: SCORE Muskegon, which offers free mentoring, business workshops, and more; the Michigan Small Business Development Center; GROW, the Muskegon Lakeshore Chamber of Commerce, the Muskegon Angels, which provides funding of up to about $200,000 for startups and businesses in the city, and the Muskegon Inventors Network, a regional nonprofit support group where inventors can connect and network. Both the Muskegon Angels and the Muskegon Inventors Network use the hub as their home base. Hub leaders are thrilled with the growth happening at their center, noting that just in the past year the center has seen 109 new products commercialized, eight new patents issued, nine companies launched, 29 jobs created, 60 companies served, and $7 million provided in “follow-on funding,” or funding made by an investor who has previously invested in a company. All of this data points to the fact that the Muskegon Innovation Hub is connecting with entrepreneurs, who are being drawn to the space in large part to connect with a wide variety of people, from their own peers to those who can mentor them. "Entrepreneurs think they have to do it alone, and that's not true," says Allison Wisneski, the business incubator manager at the Innovation Hub. "It makes it less scary when you're working with others who are going through the same thing as you." Jeff Malec, the chairman of the Muskegon Inventors Network and one of the members of CoLaunch, the hub’s coworking space, says the partnership with the hub has been instrumental for both him as an entrepreneur (he recently started Link2Launch Product Development, which is based at the Innovation Hub and which works with startups and entrepreneurs to springboard ideas into products), as well as for the growth of the inventors group. Created in 2008, the Muskegon Inventors Network is the second such group to launch in Michigan. It provides resources for startups and inventors who are looking to move an idea along, and the group offers meetings every fourth Wednesday of the month at the hub in order to connect inventors with various resources, from speakers addressing pitching ideas to product reviews. The next meeting will be Jan. 24 at 6pm; you can see all of the details here. “I’m excited to think about how I can bring people to Muskegon,” Malec says. “I’m impressed by the level of entrepreneurship and support here in Muskegon. 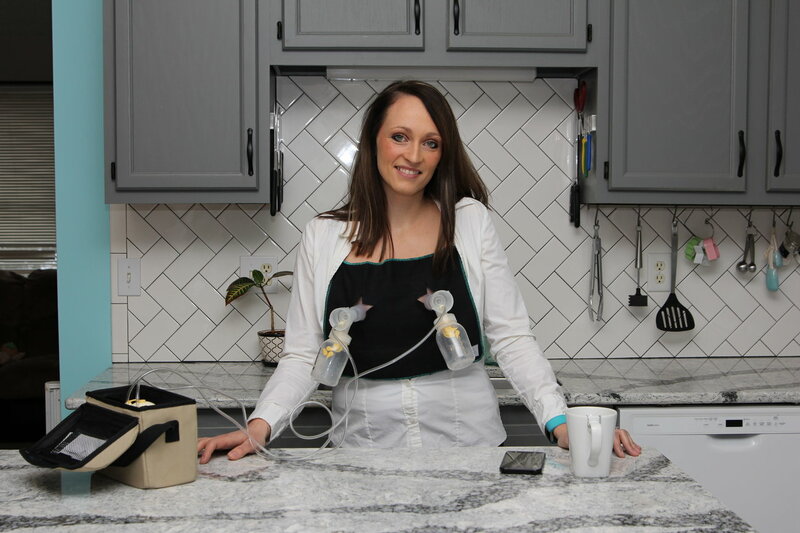 Upon first connecting with the hub not long after it underwent its name change, Burrell was able to have her product (which converts a nursing bra into a hands-free pumping bra) manufactured, receive free mentoring from Hopper, and land a few grants. Photography by Jenna Swartz, unless otherwise noted. To connect with Jenna, visit her website and Facebook page. Looking to start a business? There are numerous resources available to help you get your entrepreneurial ball rolling. 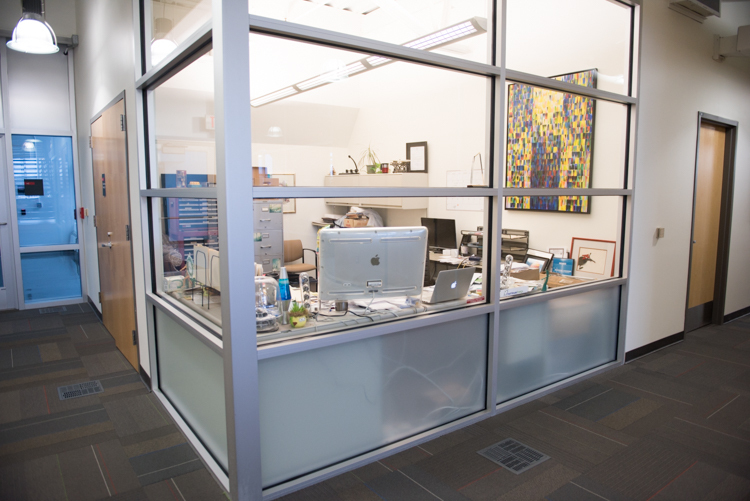 What they offer: Business incubator, co-working space, funding assistance. Contact: Call 616-331-6900 or fill out this online form. What they offer: Loans, trainings, business counseling. Contact: Call Melissa Evans, Northern Initiative's lender in Muskegon, at 231-375-9867 or email mevans@northerninitiatives.org. What they offer: Micro lending, business counseling, entrepreneurial training, networking, workshops. Contact: Call 616-458-3404, email info2@growbusiness.org, or fill out this online form. What they offer: Entrepreneurial training, mentorship. Contact: Call Dave Stradal, head of the Entrepreneurial Studies Program, at 231-777-0304 or email david.stradal@muskegoncc.edu. What they offer: Business advocacy, training, business information, meeting space, networking, and more. Contact: Call 231-722-3751 or email mlcc@muskegon.org. What they offer: Business mentoring, business training, and other resources. Contact: Call 231-722-3751 or email score@muskegon.org. What they offer: Assistance with business expansion, site location, financing, brownfield redevelopment, infrastructure development, and more. Contact: Call 231-722-3751 or email info@muskegonareafirst.org. What they offer: Business funding of up to $200,000, mentoring. Contact: Fill out the online form here. What they offer: Networking, business advice, inventor workshops, and more. Meetings are held at 6pm every fourth Wednesday of the month at the Muskegon Innovation Hub. See more information here. Contact: Fill out this online form. Where: Grand Valley State University, William Seidman Center, 50 Front Ave. SW, Grand Rapids (they also hold events in Muskegon). What they offer: Business plan development, market research, raising capital, business workshops, financial management, strategic planning. Contact: Call 616-331-7480 or email SBDCMichigan@gvsu.edu.